Bubby and Bean ::: Living Creatively: GIVEAWAY // Win a $75 Gift Card to the Shop of Your Choice from Chippmunk! 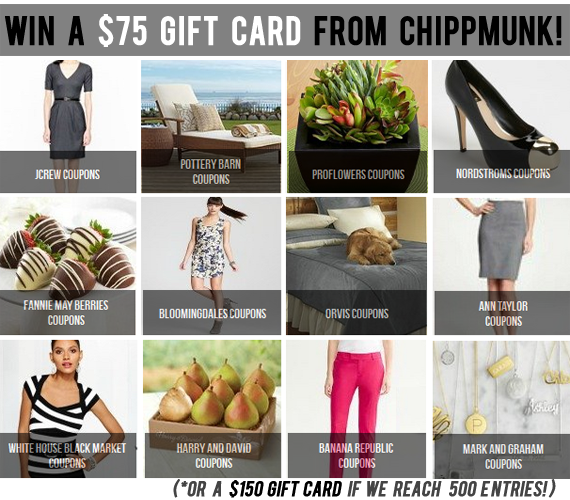 GIVEAWAY // Win a $75 Gift Card to the Shop of Your Choice from Chippmunk! Chippmunk has a pretty amazing list of shops and coupons to choose from too, from Modcloth (20% off most pinned items + $15 referral fee!) to Kate Spade (20% off!) to Pottery Barn ($10 off!) to Planet Blue (10% off!) to Williams-Sonoma (free shipping!) to ProFlowers (15% off!) and more. Not to mention that they're a really rad little company (you can read more about them in last week's interview, right here). To enter, just do a quick search on Chippmunk, then leave a comment below telling me your favorite coupon. That's it! Like Chippmunk on Facebook . Williams-Sonoma, found it searching "home" very cool site, I entered a bunch of other ways as well. If I don't win, hopefully it at least helps boost entries to double the prize for someone!! I like b1g1 at Nine West. I like J Crew's 25% off $125! I like Bubby and Bean on FB (Laura Pelkey). I like Nordstrom's half yearly sale (up to 40% off). I follow Chippmunk on Pinterest. I like Chippmunk on Facebook. I pinned the top image from this post. 40% off at Nordstrom's on intimates. I like Chippmunk on fb with name Justbyou Kim. Now following @shopChippmunk on twitter with @shopjustByou. I follow Chippmunk on Pinterest as justByou. I like Bubby and Bean on fb with name Justbyou Kim. I like the %20 off any 1 item at Ulta coupon. Love the coupon for Lucky Brand! Nice to have coupons in one place! I liked Chippmunk on Facebook. I followed Chippmunk on Twitter. I like the Nordstrom coupon!! j crew 25 % off! My favorite coupon is 20% off + free shipping at Kate Spade!! I like Chippmunk on facebook! I like the Nordstrom's sale and the LOFT coupon. They are both offering 40% off! I like Chippmunk on FB. Following Chippmunk on Twitter (@sazzyfrazzy). Clicked your "Like" button to like this post on FB. I also like the Modcloth coupon! I've always wanted something from there. Love the 20% off coupon for Ulta! I like the 25% off 1-800-flowers coupon. 40% off coupon for Nordstrom! I clicked the Facebook like button on this page. Love the aeropostale coupon for 30% off + free shipping! Love all their Sephora coupons! Thanks for the chance to win! I like Bubby and Bean on Facebook (https://www.facebook.com/kimberly.sterling.5?ref=tn_tnmn). i like the nine west buy 1 get 2ed 50% off coupon! Love me some BCBG discounts! I follow Chippmunk on Twitter. I follow Chippmunk on twitter (@channynn). This site is really great, I keep finding more stores and deals! I'd never heard of it before, thank you! My favorite coupon was for $15 off $50 at modcloth. Wow! Great modcloth coupon. Thanks for introducing me to the site. I think my pickup is the modcloth coupon! My favorite coupon would be anything that was free! Love your site, and am doing the vinyl records for my step-daughter's 50th birthday. Am having lots of fun with it. Waiting for the 3 tier cake metal rods. :-) Keep up the creative work, as we all enjoy following. I like Bubby & Bean Art on fb!